Just like people do, dogs also need their teeth checked over regularly and keep them healthy. With proper dental care, your dog will not have problems with its teeth, so it important to know with what you are treating your pet. Here are 10 best dog dental supplies which will help your pet have strong, healthy teeth. This product is very easy way to take care of your pet’s teeth if you don’t have time to brush your dog’s teeth regularly. It comes in powdered form and you only have to add it on a daily base on dry or wet food. You pet friend will love that small amount which you’ve added to the food. It will work systematically and it doesn’t change the ph of the mouth, or even kill off the normal levels of bacteria. It is made of seaweed so it is 100% safe. Pet King Oratene drinking water additive will reduce plaque formation in your dog’s mouths. It is flavorless and it has to be added to a drinking water so it is simplest and healthy way to improve oral health of your pet. With one bottle you will have 60-day supply for one average sized dog. It will not interfere with any medication which you are giving to your pooch. 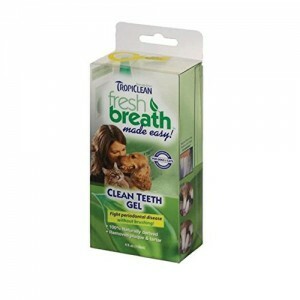 Tropiclean fresh teeth gel works really fast and helps reducing plaque and tartar on dogs, or even cats. You won’t need to toothbrush. This product will also kill the germs that cause bad breath, plaque and gingivitis and also sooth minor gum irritations. You pet friend will have healthy teeth and fresh breath every day. One of the best toothpastes on the market today, without doubt is this toothpaste. 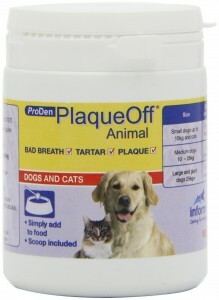 It has formula that is specifically made for pets and it will help control of plaque. If your favorite pet has bad breath, it might be because of the germs that are multiplying in is mouths, so it is important to use something to get rid of them. That something is Petrodex toothpaste. It is poultry flavored. This is very effective dog breath freshener. It is one of the most effective dog dental care and breath freshener on this 10 best dog dental supplies list. 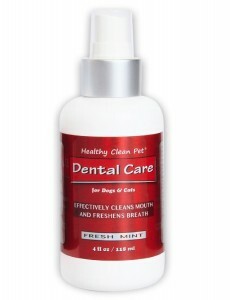 Healthy Clean Pet made this with new fresh breath formula which is scientifically developed for dog dental care. Your dog friend will have minimized plaque and tartar and it will be healthier than ever. This is yet another pet additive that should make its way to become a part of a healthy oral care routine for your pet. It is an exclusive no brush formula, you just need to add it to your pet’s water bowl. It will reduce tartar and plaque of teeth and gums. As for the bad breath, this is an excellent formula that will take that bad breath away, trust me. Don’t let your dog suffer from some kind of dental disease. Your pet friend will love this dog treats, shaped like toothbrush. They are edible, made of natural vegetables with no added chemical or meat byproducts. They will help freshen breath and reduce plaque on your pet’s teeth. If dental health is important to you, then dental health of your dog should be equally important too. 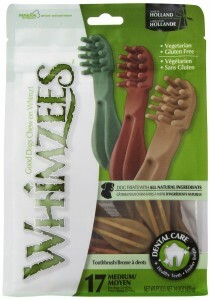 Low fat and high fiber, this treats are meant for dogs of 22 to 40 pounds. 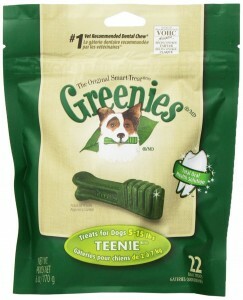 Greenies dental dog treats help clean your pet friend’s teeth just by using their chewing action to wipe away plaque and tartar from the surface of the teeth. This product has Veterinary Oral Health Council Seal of Acceptance for plaque and tartar control and because of that you know that you are buying only the best for your favorite pet. Your dog will love it, and you will love the price. If you ever wanted an easy oral care for your pet, then this is the oral care dental kit for you. It is designed for adult dogs, and it has larger brush that gently massages your pet’s teeth. Kit includes a toothbrush, a finger brush and Advanced Oral Care Natural Peanut Flavor Toothpaste. It will reduce plaque and harbors bacteria. And because of peanut flavor, your dog will enjoy cleaning its teeth. Last place of this 10 best dog dental supplies list goes to Nylabone liquid tartar remover. It is made with Denta-C, so it will reduce plaque that harbors bacteria and since it is easy to use, you won’t need to brush your dog’s teeth, just add this product to water. It alters the pH of your dog’s saliva and with that controls tartar production. Price is very low for this kind of product. Taking care of your pet’s dental health should be equally important as taking care of your own dental health, so these 10 best dog dental supplies will help you in that and make your dog happy and its teeth healthy, and that is only important.